Residents of Beijing have to deal with heavy smog, toxic rivers, sinkholes, and heaps of trash—and now, a sinking city. The city, which has a metropolitan population of around 20 million people, is sinking at a rate of 4.5 inches, or 11 centimeters, per year in some parts, according to satellite findings published in the June edition of journal Remote Sensing. “Beijing is one of the most water-stressed cities in the world. Due to over-exploitation of groundwater, the Beijing region has been suffering from land subsidence since 1935,” the authors of the study, led by Beijing-based researchers, wrote in an abstract of the study. The city has depleted most of its groundwater, which is the cause of the sinking, the study found. Researchers used satellite imagery and GPS data to compile their findings. They analyzed topographical trends from 2003 to 2010, concluding that the city is dropping in level. The districts of Chaoyang, Changping, Shunyi, and Tongzhou are the most severely impacted areas. 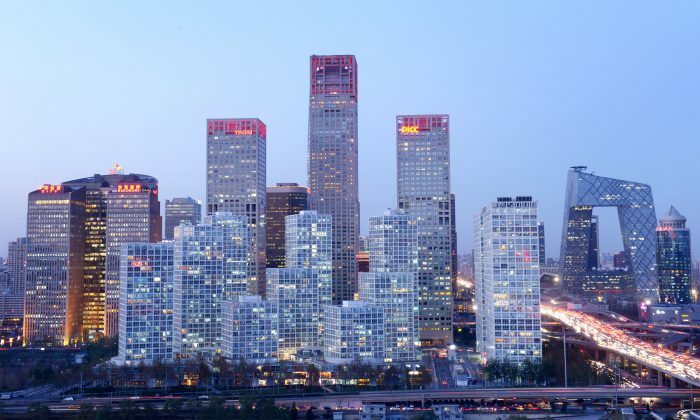 Chaoyang—home to high-rise hotels and offices in Beijing’s Central Business District—was identified as the most severely impacted area by the land problems, the study found. Most of Beijing’s water supply comes from groundwater, and as it is more aggressively extracted, it dries out the subterranean ground, causing the city to sink, the researchers said. And Beijing isn’t the only city that has subsidence problems. State-run outlet China Daily reported in 2012 that 50 Chinese cities are sinking, leading to the damage of buildings, pipelines, bridges, and urban drainage systems. The report noted that Xi’an, the former Chinese capital, located in northwestern China’s Shaanxi Province, has sunk by more than 200 millimeters, or about 8 inches, since 1959. Across China, as many as 79,000 square kilometers, or 30,500 square miles, of land have also dropped more than 200 millimeters, Zhang Zuozhen, vice-president of China Geological Environmental Monitoring Institute, said in the China Daily report. Meanwhile, China can’t turn to most of its rivers for water—the country’s Ministry of Water Resources said around 55 percent of China’s 50,000 rivers that existed in the 1990s have disappeared, according to a 2014 report published by The Ecologist.